This candle will be custom loaded for you with a very old attraction formula known for it's results! Adam and Eve are a symbolic couple with a rich, well known history and are symbolic in hoodoo. This candle depicts a hetrerosexual couple, entwined in a loving embrace, and firmly rooted into a brick foundation. Ground your love goals right to you and your desired one! LISTING IS FOR ONE CANDLE. Works very well for enticing new people or bringing the flame and desire back to marriages. Married women often use it to keep their husbands home and faithful. 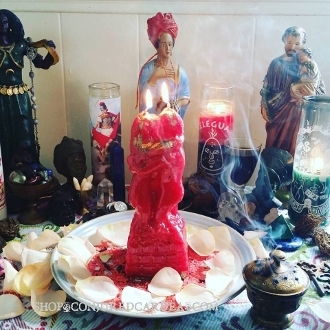 Light your candle, bless it, and add three drops of the oil to the bath saying; "With drop of one the spells begun, with drop of two I have you, with drop of three you will love only me." © Conjured Cardea™ 2009. No part of the content, designs, photographs, product trade name(s), trade product design(s) and product(s) can be used without prior express written permission. All rights reserved.